My blessings are many – I’m lucky. When placed against a larger context. (Of humanity boiled over) I’m blessed. Uncomfortably placed, scratching at my well-being. Two of my blessings right here. Before you go wondering if I need a hug, let me say that I’m not feeling down or blue. This Six Word Fridays theme got me thinking of the highs and lows of life. Sometimes when mired in the downs we need a larger perspective from which to see the fortunes (blessings) that surround us. Enough of this pontificating (dare I say navel gazing?)! Go visit Making Things Up and get yourself some more Six Word Friday goodness. Sometimes contrast is the only way that we understand our lives and remember our blessings. Love the photo with this one. And yes, so many of us are fretting over trivial problems, and this is a great reminder of priorities. Thank you! 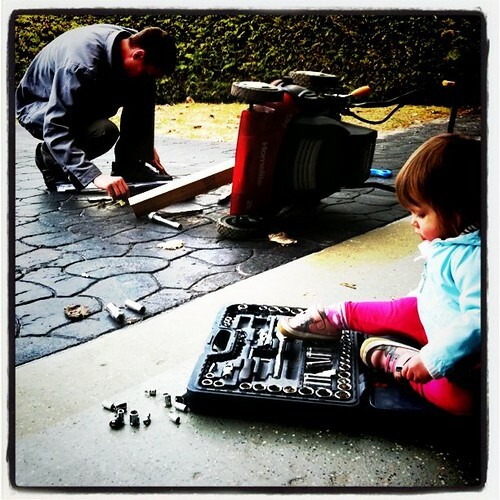 I like that — a handyman and a future handymay. You ARE blessed! I am Juliana. I really am. 🙂 I’ve never heard the expression ‘handymay’ before. I love it! It’s tricky to maintain the dual focus on this small moment and on the bigger picture. We’re bound to lose our balance on the highwire every now and again. Love the photo and your words, Mel, keeping in mind what the bigger picture looks like, are full of wisdom. Yes, how true. Our blessings, in context of those with less, do seem like an avalanche of good fortune. An avalanche indeed. Thanks Justine! With the little things weaving their way around me, I regularly need reminding that there’s a bigger picture than my here + now. This is a beautiful reminder to not sweat the small stuff. So often the small stuff gets in our eyes, preventing us from seeing the larger reality. Well done!